Ginger is a popular condiment used for cooking, as well as in traditional and folk medicine around the world. One of the most potent means of consuming this super-herb is in its powdered or ground form, which is also quite easy to prepare. To make ginger powder, you only need a coffee or herb grinder and the dried ginger root. The grinding helps increase the herb's solubility in water. Furthermore, ground ginger can be used in its basic form or as an additive in many foods. While some may find the sweet-spicy taste of ginger to be pungent, its distinct flavor and aroma are an integral part of many cultures. Ginger has been historically used in many Asian, Indian, and Arabic herbal remedies and culinary traditions. As a seasoning. Powdered ginger can be used as a pleasant spice to be sprinkled on your meal in order to reap ginger health benefits. As a seasoning, ginger is one of the most popular condiments used around the world and is essential in many Asian dishes. Ginger has been used as a flavoring agent for at least 4,400 years. A capsules. Ginger root capsules are an incredibly effective means of controlling your powdered or ground ginger dosage. Simply fill the capsule halves with powdered or ground ginger, then carefully slide the halves together. It is not recommended that you consume more than four grams of ginger per day in any form. Do not give ginger to children under the age of two years. Additionally, if giving ginger to a child older than two years, be sure to ask your doctor in order to ensure the correct dosage. Pregnant women should not ingest more than one gram of ginger per day, and should always consult their doctors before use. 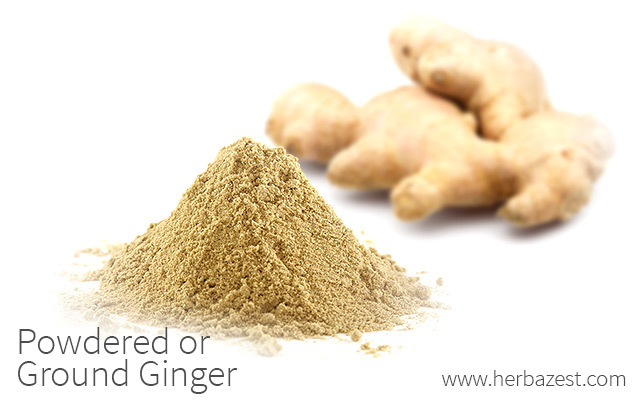 Among the most remarkable benefits of ground ginger are easing nausea, relieving headache or migraine pain, and soothing gastrointestinal issues. While raw ginger is rich in gingerols, the ginger drying process converts many of the gingerols into shogaols, which have been shown to have the most potent medicinal effects. For that reason, including powdered ginger in a daily diet may be highly beneficial. Additionally, extensive ginger research and studies have validated the consumption of ground ginger as an alternative treatment for reducing morning sickness during the early stages of pregnancy when used for short periods (no longer than four days). Furthermore, a study published in The Journal of Pain (2010) suggests that the daily consumption of ground or powdered ginger may help to reduce muscle pain following muscle injury as a result of eccentric exercise. Although ginger side effects are usually mild, when thy occur, the powdered root should always be taken with caution, like any other dietary supplement. It is also worth noting that ginger may interact with some over-the-counter medicines or prescription drugs. For that reason, you should always consult your doctor before taking ginger. Taking ginger may increase the risk of bleeding for those on blood-thinning medications, lower blood sugar for those on diabetes medications, and lower blood pressure for those taking high blood pressure medications. While it is very rare to experience side effects from taking ginger, in very high doses it may cause mild heartburn, irritation, stomach upset, or diarrhea. However, taking ground ginger by means of capsules may help to avoid some adverse effects. Whether it be sprinkled on food or taken in a capsule, powdered ginger is a convenient method of reaping all ginger's health benefits. Easy to prepare, powdered ginger root is a must in any spice or medicine cabinet.